A book that is practical and filled with step-by-step techniques is one of the highest return-on-investment resources you can get. If you spent $60 on a book, and created just one meaningful KPI that gave you a single insight about how to improve performance, wouldn’t that be worth it many times over? And the great thing about Practical Performance Measurement is that you can start anywhere. You don’t have to read it from cover to cover. I think you should, of course! 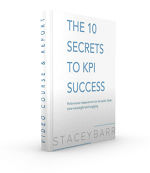 But you can still pick out the KPI template that will help you most right now, and get started immediately. #1 Make one of your hard-to-measure goals more measurable with the Measurability Tests template. We can spin our wheels, get dizzy in circular conversations, and burn ourselves out making no progress at all when we try to measure a vague or intangible goal. Stop the madness! What you might not know is that when a goal is vague or intangible, it needs some help before you should try to measure it. This help comes through the five sensible and logical measurability tests that are detailed in Chapter 5 of Practical Performance Measurement. Do you have a vague or intangible goal that you’re struggling to meaningfully measure? #2 Align your existing KPIs to the strategic and operational goals throughout your business with the Results Map template. Many organisations feel paralysed by performance measurement because they have a whopping big pile of KPIs that have no structure or alignment. KPIs should be aligned to goals or objectives or priority results. Also in Chapter 5 of Practical Performance Measurement you’ll find instructions for building a Results Map. It’s a powerful map for cascading strategy, but many people don’t realise it’s also a brilliant way to audit your KPIs by testing their alignment to strategy. Have you been searching for a way to cull your useless KPIs and clarify which KPIs really should be in the spotlight? #3 Create a better KPI to measure a goal you’re struggling to achieve with the Measure Design template. Business improvement is a bit like health and wellbeing; we want to invest in fixes that we know won’t fail us. We want to stop guessing, and confidently throw our energy into implementing solutions that make performance improve. A good KPI is the test of any solution. So if you have a goal that you’re just not achieving, you might need to design a more meaningful KPI for it, and use that KPI to guide your evaluation of solutions. In Chapter 6 of Practical Performance Measurement you’ll find the revolutionary Measure Design technique, that works every time to help you find the most relevant and feasible measure for your goal. Do you have a goal that just isn’t becoming reality? Is it measured meaningfully? #4 Reveal the insightful signals hiding in your KPI with the XmR chart template. An alarming number of decision makers ride a numbers rollercoaster every month, when they evaluate their KPIs. They try to explain or remedy every difference they see from month to month. This is what I call “knee-jerk” reacting to KPIs (like when the doctor taps your knee with a little rubber thingy and your knee jerks in reaction). you’re blue in the face! An easier way to explore this idea, though, is to try out the XmR chart, which is detailed in Chapter 10 of Practical Performance Measurement. What is one KPI that you could try out in an XmR chart, just to see if you can find signals you never knew were there? #5 Make your performance dashboard insightful and actionable with the PuMP report template. So many leaders seem to be either overwhelmed by the detail of their paper-based performance report, or underwhelmed by the cute but irrelevant gauges and dials of their performance dashboard. Performance reporting is only one fifth about visual design and layout. Eighty percent of performance reporting is about the architecture of information that serves the purpose of improving business performance. If your performance reports or dashboards fail this purpose, find out which of the five principles of reporting performance measures you’re missing, in Chapter 9 of Practical Performance Measurement. 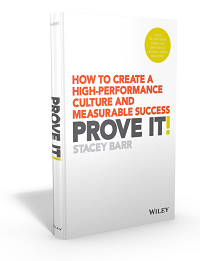 How quickly and easily do your performance measures initiate performance improvements? A book that is practical and filled with step-by-step techniques is one of the highest return-on-investment resources you can get. Grab your copy of the first edition of Practical Performance Measurement (either from an amazon store or from your bookshelf! ), and pick just one KPI template to make just one quick improvement to your performance measurement. hello I am doing a presentation for university of ulster on non-financial kpi’s in food and beverage operations and was wondering did u have any information based round that I could use? Neill, I focus my work on the process of how to measure performance, not on providing measures for specific functions or industries. On this blog you’ll find plenty of information about ‘how to measure’ but I’m afraid this isn’t the place to find ‘what to measure’. All the best with your presentation.